Have you ever wanted to go back in time to fix something in your life? The Dream Police rejoins the characters from Blazak's 2011 novel, The Mission of the Sacred Heart, fifteen years later. Zak and Lenny are in rapidly gentrifying Portland, Oregon, connected my their mistakes, one horribly tragic. They stumble upon lucid dreaming as a way to visit their favorite moments in rock and roll history, and maybe find alternate routes their own lives should have taken.Like Mission, The Dream Police is a rock novel. The story is built on the 1979 Cheap Trick album, using its songs to guide the musical fiction. 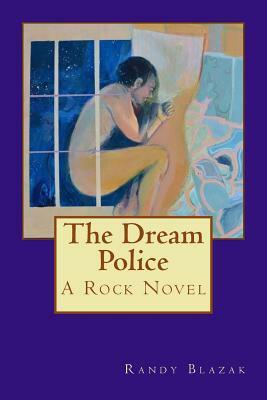 The book tackles weighty issues, like gentrification, the commercialization of music, and the sexual politics of higher education, with humor and the energy that comes from a great song.The Dream Police is an innovative story, existing in both real time and dream time. Because it is rooted in the author's experiences as a sociology professor, the book is intended to help people heal. Randy Blazak earned his PhD. in Sociology from Emory University in 1995 after an extensive field study of racist skinheads. From 1995 to 2015, he was an award-winning professor at Portland State University, publishing his academic research on hate groups and prison gangs. His first novel, The Mission of the Sacred Heart, was published in 2011. Since then he has published short stories and worked on screenplays. His works of fiction are largely inspired by his love of great records. He and his records live with his artist wife and their daughter in Portland, Oregon. "Randy Blazak's rock novels are fierce examples of art imitating life imitating art." - Angie Bowie, author of Lipstick Legends.